Your core muscles are key to spine stability, as one of the main supporting blocks of the spine. People demonstrate greater improvement of spinal and core stabilization and have less back pain problems when they practise targeted exercises to strengthen their core muscles, like the Hundred. 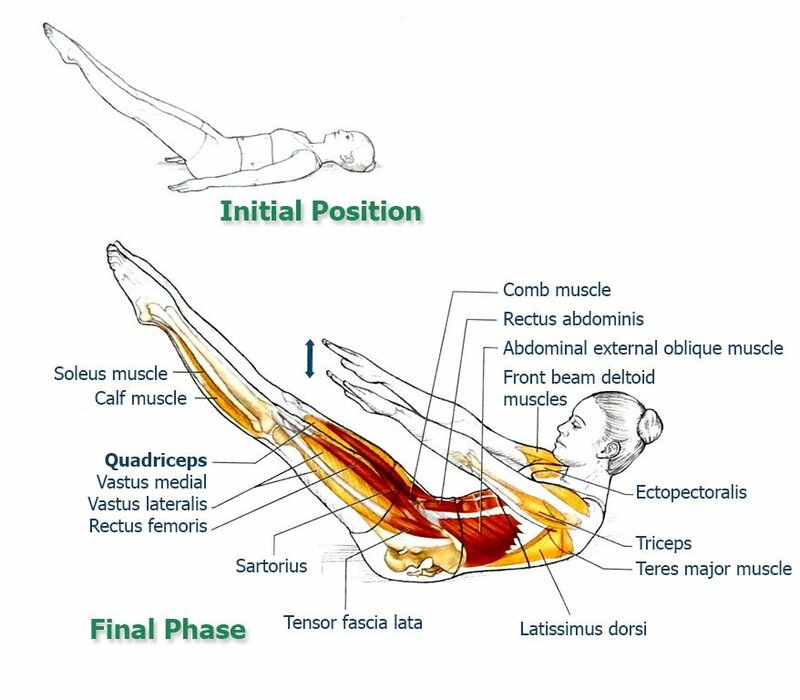 In today’s exercise, Hundred, the abdominals are used in an isometric manner to maintain a position of spinal flexion while the legs are held out straight in the air and off the mat. The exercise Hundred offers a particularly difficult challenge to spinal and core stabilization. You have to maintain a constant position of spinal flexion while keeping the legs off the mat (with extended knees) as the arms repeatedly and energetically move. Because of these challenges, the exercise benefits individuals with adequate strength and skill. However, it is inappropriate and potentially risky for people lacking it. In fact, most people are not adequately prepared to perform this exercise with the legs held near to the mat. By using the modifications mentioned below, you can progress slowly to a more challenging leg position. One additional thing to note: the contraction of the hip flexors holds the legs off the mat against gravity. 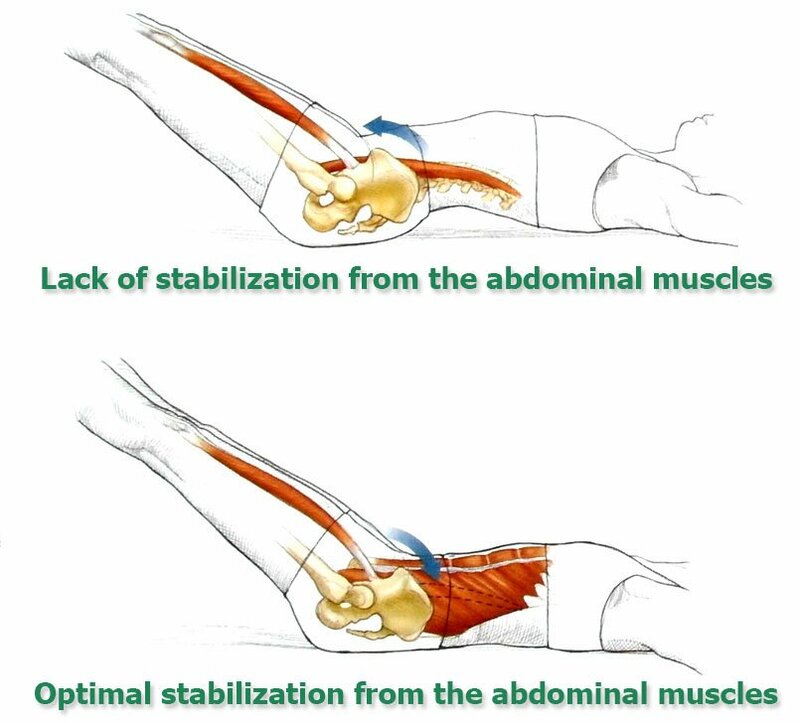 Because of the attachments of the hip flexors (especially the iliopsoas and rectus femoris) onto the spine and front of the pelvis, their contraction tends to cause the lower back to arch and the pelvis to tilt anteriorly unless a simultaneous abdominal stabilization is performed (see the illustrations). Since both legs are off the mat and the knees are straight, the legs produce much greater torque. This requires a much stronger contraction of the hip flexors to keep the legs off the mat. It is also a greater challenge for the abs to achieve spinal and core stabilization and keep the lower back from arching. The closer the legs are to the mat, the greater the muscular force required to counter the weight of the legs and the greater the challenge of the exercise.